What is Youth to Youth? 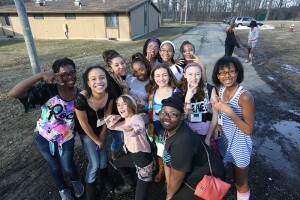 Every year Youth to Youth offers various events for Central Ohio middle school students. Everything from trainings to leadership days to our most notorious middle school camp titled, The CAMP! With funding provided by the Youth to Youth “Comedy and Music” fundraiser, we are so excited to offer a wonderful opportunity to middle school students. “The CAMP” is a 2 day overnight experience for middle school students in the 6th, 7th and 8th grade. During “The CAMP” students will hear a national motivational speaker, attend large group presentations led by high school teens, participate in a team-building challenge, meet other students from across the county in small discussion groups led by high school teen leaders and adult volunteers, go crazy at the themed dance and much more.